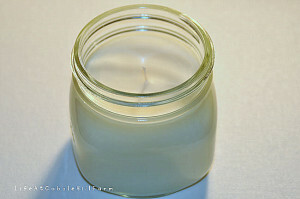 This is a nice, simple recipe and tutorial for soy candles by Staci of Cobble Hill Farm. She recommends using wax flakes because they are easier to melt. Soy is good wax choice because it’s affordable, and has a longer burn time. Also one pound of soy wax flakes will fill a pint-size canning jar, which is convenient for measuring. Staci lists all of the supplies you’ll need for this recipe. She leaves the amount of wax open. If you’re making a single 1-pint candle, use 1 pound of soy wax flakes. For additional 1-pint candles, increase the wax accordingly. The post contains step-by-step directions, and also includes pictures. Click on the How to Make Soy Candles to see the complete tutorial.